Playing great defense and displaying intelligent play on the offensive end, Nestor Garcia’s team finished the night proudly and loudly shouting "Champions". Argentina built an early double-digit lead as they worked the ball into the low post. 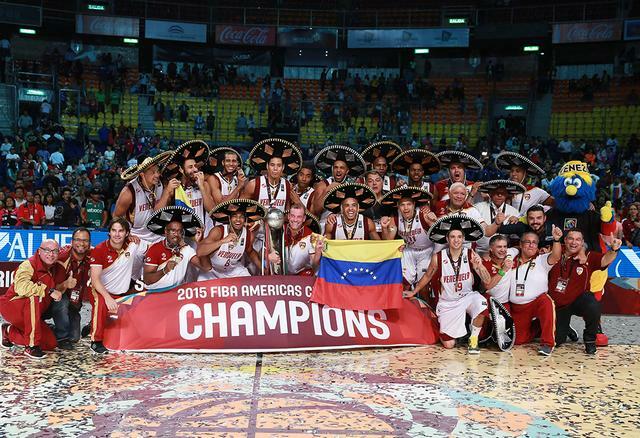 Taking advantage of Venezuela’s mistakes, they led 11-0 on a three-pointer by Andres Nocioni. Venezuela looked out of ideas offensively. Luis Scola, who was earlier honored as the championship’s all-time leading scorer was key as Argentina continued to stay comfortably on top. Despite not playing well, a three-pointer by Graterol beat the first quarter buzzer and saw the Venezuelans cut the deficit to 20-13. Everything changed at the start of the second quarter. The Venezuelans came back strong, defending hard and using a run to get within 20-19. Graterol was huge and the team looked like the one that reached the Final by upsetting Canada in Friday’s Semi-Final. A pair of free-throws from David Cubillán gave the Venezuelan the first lead of the night, 30-28, at the end of the second quarter. Nestor “Che” Garcia’s men carried over that same intensity into the second half and an initial 4-0 run allowed them to take an six-point lead, 34-28. Argentina, meanwhile, could not score with ease anymore and were suffering against their opponents’ stifling zone defense, going 1-of-11 from three-point range and scoring just eight points in a 14-minute stretch. Venezuela’s patient ball movement resulted in success, while Nocioni and Nicola Laprovittola kept Argentina within striking distance and Sergio Hernandez’s men took a 52-49 lead into the fourth quarter off of a Scola basket. Nestor Colmenares’ return into the game in the final frame was decisive as Venezuela reclaimed the lead in the first three minutes of the period. A good defensive effort on Scola and four consecutive points saw the Venezuelans go up by three, 57-54. The game was turning into an instant classic as Selem Safar converted a four-point play to edge Argentina back in front, 58-57. But Venezuela did not lose their composure and instead stepped up the defensive intensity and scoring six unanswered points to pull away, 63-58. Argentina’s fighting spirit allowed them to get within two with 10 seconds left to play, but a pair of free-throws from Dwight Lewis sealed the game and the win for the Venezuela, who wrote a new chapter in the country’s basketball history. Luis Scola (Argentina), who led the tournament averaging 21.1 points, along with 10.1 rebounds per game (2nd best in the tournament), was named Most Valuable Player of the Championship, presented by Tissot. Scola headlined the All-Star Five which also consisted of Heissler Guillent (Venezuela), Andrew Wiggins (Canada), Andres Nocioni (Argentina) and Gustavo Ayon (Mexico). The Canadian Basketball team won the Bronze medal in the 2015 FIBA Americas Championship with a Cory Joseph buzzer-beater against Mexico by the score 87-86. Read the full game report here.